Krafting Kreations: You Make Me Smile! This fun little bag is what we made for the 3d project during the April Make and Take. It was my farewell to the Fancy Favor box that is now sadly retired. This is such a cute and easy gift box to make! I started off by cutting a piece of Certainly Celery card stock 5-1/2” x 11” and running it through the Big Shot on my Fancy Favor Die. I really am going to miss this simple and pretty box die. I stamped the medium image from Flowering Flourishes all over the box in Certainly Celery ink. Then I folded on the score lines, added Sticky Strip onto the side tab and one of the bottom flaps, then formed the box like normal. Now with your box sitting on the table take your middle finger and push in on the sides while you pinch the front and back of the box together. This will make it look more like a bag. Next I cut a piece of Tangerine Tango card stock 4” x 4-3/4” and ran it through the Big Shot with the 4th from smallest Label Framelit. I placed the label on my Simply Scored with the points on the sides lined up with the score groove, and scored the label right in the middle and folded on the score line. I added a piece of Sticky Strip about 1” long on the inside of one half of the label and adhered the label onto the back of the bag. Then I cut a piece of Floral District DSP 3-1/2” x 3-3/4” and ran it through the Big Shot with the 3rd from smallest Label Framelit. I scored the DSP just like I did with the Tangerine Tango card stock then used Anywhere Glue Stick to adhere the DSP label onto the Tangerine Tango label. For the flower I stamped the image from Mixed Bunch twice onto a scrap of Daffodil Delight card stock and punched them out with the Blossom Punch. I used my Bone Folder to curl the petals up on one flower, and down on the other flower. Then I simply adhered the flowers together. I stamped the greeting from A Round Array onto a scrap of Whisper White card stock in Certainly Celery ink and punched it out with the 7/8” Scalloped Circle punch. 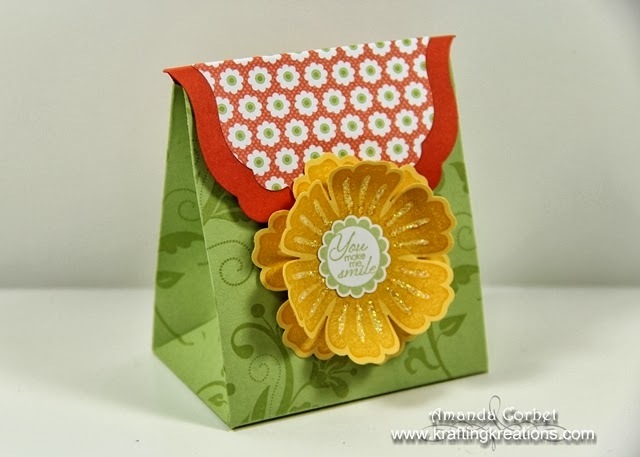 I adhered the greeting inside the center of the flower and adhered the flower onto the front of the bag with a single Stampin’ Dimensional. The label flap on the bag slides down behind the flower and the flower keeps the bag closed. Now of course I had to add some sparkle… so I added Dazzling Details onto the petals of just the top flower. Super cute, fun, and sure to make someone smile!